Experimental research is crucial in the product development process. WOLTER is well equipped with all essential measuring and test equipment. The aerodynamic performance fan curves of all fans are determined by Chamber tests in accordance to ISO 5801 and AMCA 210. Sound level measurements conducted in a reverberant sound room permit the acoustic optimization according to individual customer requests and requirements. For Research and Development, quality assurance, factory acceptance tests, modern in-house testing facilities and calibrated measuring equipments are at our disposal. 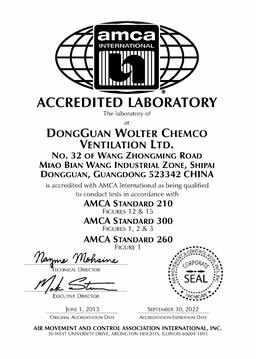 WOLTER's Testing facilities are accredited by AMCA (Air Movement & Control Association).